DURLEY, Helen – Peacefully, at the Welland Hospital on Sunday, February 3, 2019, after celebrating a monumental 100th birthday on January 4th . 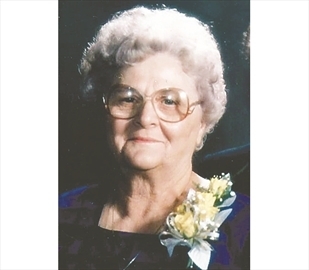 Beloved wife of the late John Durley (2005) for 68 years. Loving mother of Douglas (late Sydna) and John (Diane). Cherished grandmother of David (Barbara), Jennifer (Sylvain), Joan, Jim (Shannon), Shelly (Brett), Brenda (Neill) and great-grandmother of Brianna, Lauren, Connor, Ryan, Kaylin, Monelle, Kirsten, Emily and Alyssa. Lovingly remembered by many nieces, nephews, great nieces and great nephews. Helen is predeceased by her sisters Mary, Kay and Verna and brother George. Helen was the very proud recipient of the prestigious Queens medal for her decades of volunteer work. The family will receive friends at the H.L. Cudney Funeral Home, 241 West Main Street on Wednesday, February 6th from 2-4 and 6-8 p.m. Vigil prayers will be held on Wednesday at 2:00 p.m. A funeral mass will be held at Sts. Peter & Paul R.C. Parish, 300 Chaffey Street, Welland on Thursday at 11:00 a.m. Rite of Committal to follow at Holy Cross Cemetery. As an expression of sympathy, donations to Rapelje Lodge or charity of choice would be appreciated by the family. Online condolences available at www.cudneyfuneralhome.com .